To enhance the security of a network, in many environments access to the management of a pfSense firewall will be limited with the use of firewall rules. Restricting access to management interface is strongly recommended, for reasons as to why, see the blog post Securely Managing Web-administered Devices. The default configuration of pfSense allows management access from any machine on the LAN and denies it to anything outside of the local network. There is also an anti-lockout rule enabled by default that prevents firewall rules from being configured in a way that will lock the user out of the web interface. To restrict management access first ensure the LAN rules allow access to the port used for the WebGUI. This depicts the default LAN rule, which allows access to the web interface. If a restrictive ruleset is in place on the LAN, make sure it permits access to the web interface before continuing. Now disable the anti-lockout rule. Navigate to System > Advanced, Admin Access tab and check Disable webConfigurator anti-lockout rule. Click Save and the rule will be removed. 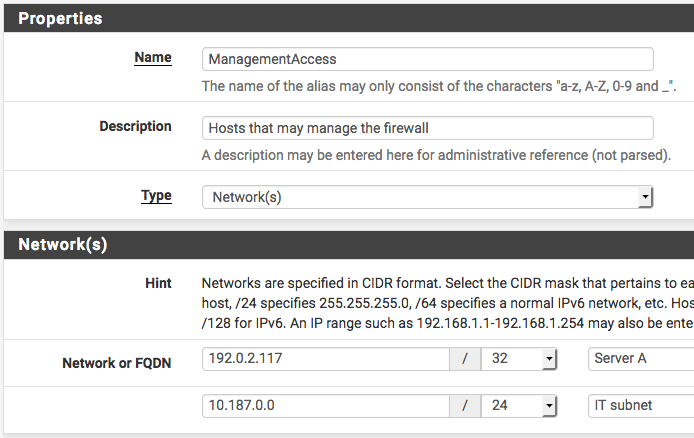 Now add a firewall rule allowing the sources defined in the management alias to the destination of the firewall, with the port used or alias created for those using multiple ports. Make sure this rule is first in the list. Then add a rule based on that rule (click next to the rule), changing action to block or reject (reject is preferred on internal networks), source to any, and destination the same. When finished the ruleset should look like the following. Click Apply Changes and the management interface is now restricted to only the defined hosts.